4-3/4" x 6-1/2" x 3/4"
This extra large photo crystal features a rectangular shape and beveled edges. It can be used to laser engrave your favorite picture inside to be personalized as a unique and memorable gift. 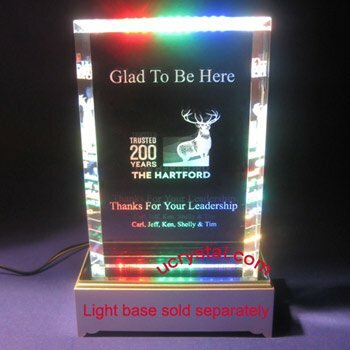 There are so many occasions for which the personalized photo crystal gifts are suitable, such as corporate engraved crystal plaques and customer appreciation gifts. Simply upload your photo and let us know your message, we will take care of the rest. Your stunning personalized photo crystal gift will amaze your friends and colleagues. Please take a look at the example on the left, during which a group of employees attended a corporate training session and presented the teacher with this elegant engraved crystal plaque. 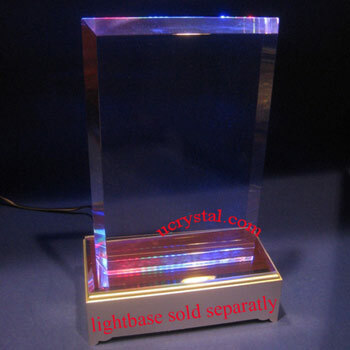 Please browse our websites for the large selection of 2D or 3D laser photo crystals for personalized laser engraving. Extra large, Rectangular, bevel edge without base. Size: 4-3/4" width x 6-1/2" height x 3/4" thickness. The laser engraved photo crystal is best viewed with a dark background, or on a crystal light base.